Land Diagrams is an ongoing series in which commissioned writers respond to the same visual encoding of landscape. See here for info. First response by MIKE BAILLIE, Emeritus Professor of Palaeoecology at Queen’s University Belfast and author of A Slice through Time (1995); second response by PAUL WARDE, Reader in Early Modern History at the University of East Anglia and author of Nature’s End: History and the Environment (2009). When a dendrochronologist is confronted with a sectional drawing of what appears to be a pine stump that grew from 1843 to 1852, a series of issues spring to mind. If the drawing is purely theoretical why label the rings with those particular dates? It would be more logical, if indulging in theory in early 2013, to label the rings 2003 to 2012; 2012 then being the last year of growth. This would have the bonus that the date of the last ring would also relate to the last year of the Mayan calendar. However, if the stump really was from a tree that grew from 1843 to 1852, then this raises the question of how on earth such a stump was dated? With only nine growth rings, and those rings showing a ‘wide, narrow, wide, narrow’ repeating saw-tooth pattern, it would not have been possible to definitively date this ring pattern against any master pattern. So this leaves the possibility that someone had cut and preserved an actual documented stump; perhaps in a museum or university collection. The problem is that back in the 1850s it is unlikely that anyone had enough interest in tree rings to preserve such a sample. Now the reader may be saying that too much is being read into this simple sectional drawing. However, the drawing contains detail that moves it beyond merely theoretical. The ring indicated for the year 1847 is discontinuous around its circumference. This is a situation commonly observed in conifers especially in such trees from semi-arid environments. So might the drawing be of a tree from the American Southwest? A quick foray into Volume 1 of Tree Ring Bulletin (No.3, page 19) shows that 1847 was indeed a notable narrow ring – and presumably a notably dry year – in the Western Pueblo area of the American Southwest. In fact a bit more searching confirms that 1847 was quite a notable fire scar year in the American Southwest, raising the spectre that the partial 1847 growth in our illustrated tree might be related to fire damage higher up the tree from which our stump survives. So the drawing makes a kind of sense, which may hint at its origin. We can now imagine that someone, in recent time, is interested in fire history in, say, Arizona. They are investigating the remains of a stand of trees killed in the historically recorded fire of 1852 (there was one). Being Arizona, where it is so dry nothing decays, the charred stumps are still standing a mere century and a half after the fire. So one of the stumps is cut and brought back to be used in teaching or research. A diagram of its ‘history’ is drawn specifically to illustrate the partial 1847 (fire damaged?) ring. Now for the reader who is keeping up, an obvious question might relate to why a fire in 1847 caused a problem ring while another in 1852 left no similar trace? The answer could relate to the season of the fire. Perhaps in 1847 the fire was early in the year and it swept through quickly, merely damaging the tree and allowing it to register the trauma as a partial ring. The 1852 fire was much more severe and late in the growing season; it actually killed the tree. Once we observe this last possibility, it makes sense of why our tree was capable of being dated, why it was sampled, and why it was drawn. In two books I have been responsible for relevant aphorisms. In Tree Ring Dating and Archaeology (Baillie 1982) I stated that ‘the trees have the gift of immortality’ because they can tell us their death dates long after they have died. In A Slice Through Time: dendrochronology and precision dating (Baillie 1995) it was ‘the trees don’t lie’ because they are pragmatic recorders and ‘they were there’. It looks as though our illustrated stump may live up to these expectations, telling us it died in 1852 (or just possibly early 1853) and that it suffered something traumatic in 1847. I can’t make this particular tree live up to the next aphorism that can be found in Exodus to Arthur: catastrophic encounters with comets (Baillie 1999). There I have ‘the trees warning us’ because the worst events they record appear to have involved ancient episodes of extra-terrestrial bombardment. However, there is no doubt that from an Irish point of view the lifespan of this tree, theoretical or not, spans one of the great catastrophes of Irish history. Between 1845 and 1852 the failure of the Irish potato crop caused the death of approximately one million Irish people and the emigration of another million. One cannot make this point, in the context of a dendrochronological discussion, without addressing the fact that Irish oak trees also noticed the early 1840s. The five growth rings for 1840 to 1844 are notably reduced in width. The exact environmental cause is not known though these years follow an exceptional storm event on 6 January 1839 when what was effectively a hurricane swept across Ireland. Suggestions of three million trees being blown down are probably exaggerated, but serve to illustrate how bad conditions were believed to have been. Certainly large amounts of salt spray were blown across the island and it is not beyond the bounds of possibility that this had something to do with the growth reduction of the following five years. Now that we are thinking ‘catastrophically’ let’s go back to our illustrated pine stump. If we refer to Swetnam and Baisan (1996) we find that the American Southwest suffered large fire outbreaks in 1842, 1847 and 1852. Our tree has pith for its first year of growth in 1843, so it may well have started growing in 1843 as a direct result of being planted in a location ‘cleared’ by the fire of 1842. If that were true then the life story of our tree would run from its seed landing on the cleared and fertilized ground left by the 1842 fire, through its survival of the trauma of 1847 to its death in the fire of 1852. Unlucky tree, or just a theoretical sketch? Swetnam, T. and Baisan, C. (1996). Historical fire regime patterns in the southwestern United States since AD 1700. In: CD Allen (ed) Fire Effects in Southwestern Fortest : Proceedings of the 2nd La Mesa Fire Symposium, pp. 11-32. USDA Forest Service, Rocky Mountain Research Station, General Technical Report RM-GTR-286. What is a tree ring that wood without such form is not? What substance does it bring? Of course, in this image, the dated vertical marks embody the history. A tree takes time; it has been building its character as surely and steadily as the deepest furrowed brow or firework of smile-lines. Trees are no fleeting thing. They anchor a life, or a set of memories, if there is any difference between these ideas. We are, stereo-typically, rooted by them, and bound to past generations, which is perhaps why the upended and exposed rootstock of a storm-felled tree seems abominable at first glance, like a bomb set off in a graveyard. But then I am already thinking this diagram may refer to a certain kind of tree: grand, grown wise and hunkered to its place, thoroughly anthropomorphic. An old tree should be big, at least for its kind, and the felling of great trees seems too the greater crime, an exercise of too arbitrary power by a species grown overbearing with their tools. But the ring itself – this feeds off all these thoughts, but is only present when the tree is over. What do we make of it? In the ring we meet the certain, indubitable evidence of the accretion of time, a self-willed endurance that is not just a projection of our imaginings. Of course, tree rings are not in fact the mark of the oldest tree, at least in Europe. That honour falls to coppice stools that may surpass the free-growing standard in age by many centuries. But coppice stools do not make the same impression upon most of us; in fact their longevity is, these days, little appreciated. The ring, in contrast, is not ever-shifting, brazenly youthful like a coppice. Nor does it at a glance seem to be a matter of memory or interpretation, things we have come to collapse into each other and mistrust. And yet, in its metrical surety, the set of rings also bestows to our eyes an image of power that seduces: that perfect ellipse, a receding and mesmeric tunnel of time into which the imagination can plunge. So tree rings evoke a history – perhaps also one that puts us in our place? The rings of the tree may not be so easy to decipher to the naked eye, but we know they are basically indifferent to the events that haunt school textbooks and popular histories. Revolutions, dynasties, acts of parliament: so much pulp compared to the passing of the seasons. They may, with the right equipment, tell us of a shockingly cold year, of long spring and summer rains, or as part of a construction, where and when a boat was launched or track lain out (the study of ‘provenance’). So a tree ring can make us think: which story do we think is important? And how do the stories line up? Indeed, our reaction to the histories evoked by tree rings reminds us too that the dating of rings is itself a bringing together of metrics, always an effort to calibrate across different ways of marking time. It is the outcome of an involuntarily tick that makes us place the tree (and inevitably, the felled tree) in human time. Look inside the tree, and in fact you discover no more about history than looking inside a person; or in other words, it is the knowledge that you bring with you that gives it meaning,. But you must know, in doing so, that time is not just a human thing. But for me this image is not just a prompt to think about history; it is itself a historical artefact, and an artefact of when we began to think about history in a particular way. The dates span the middle of the nineteenth century, and a time when people began to be increasingly conscious of history as a work in progress – thrilled by theories of evolution, of Ice Ages, of ‘stage theories’, of culture ‘backward’ or ‘progressive’. These thoughts were not then entirely novel, but took novel forms, and infused the sensibility of whole societies. An old tree then, as always, got new meaning; not only a bridge between generations, or a mark of dynastic continuity on some grand estate, but increasingly, a trace of a world we have lost. A wooden question mark of respect and preservation: ‘ancient’, a museum piece, to be protected, if not at all costs, then at least from disregard. So much for looking back. But at this historical moment, the middle of the nineteenth century, forestry was above all about looking forward. In medieval and early modern times, foresters were much more interested in the precise age of the tree when it was younger – recorded in their surveys in years or decades. As the tree got older, it became (in English) simply ‘timber’ or a ‘dotard’. 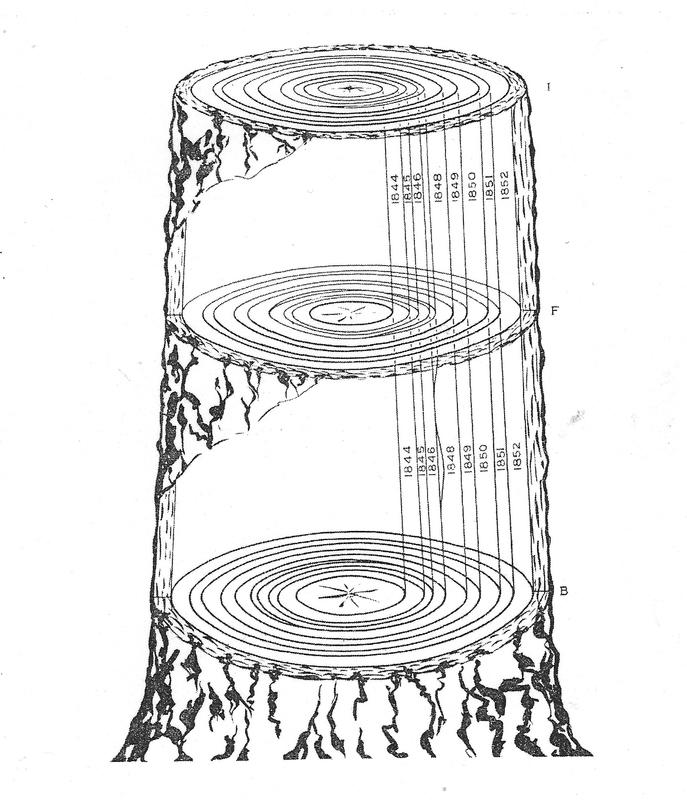 As someone who has read very many records of forestry practice and theory, it is hard to think of any detailed consideration of age before the mid-eighteenth century, or indeed the process of ageing of a tree, or mention of rings (although people were perfectly capable of roughly dating the age of stands of trees). The forestry revolution that began in mid-eighteenth century Germany (sometimes called ‘scientific forestry’) changed this: it turned trees into a figuration of the future. The use of geometry and algebra developed rapidly to calculate (some hoped) exact growth rates and patterns of trees, at first a rather generally expressed desideratum, but soon a matter of precise calculation (one must always remember that such policies still took decades to be implemented on the ground, if at all). Ever more detailed surveying of growth conditions was demanded to fine-tune the predictive accuracy of forest plans (hence forestry monocultures actually required a more detailed knowledge of micro-environments than anything that had gone before). Thus rather than as a record of time past, we could see this image of dated rings as predictive; at the time, something far more useful to the active forester. This date is when the tree will be this size; this is when to harvest for this use; this is when the stand should cut and reseeded for maximum yield or monetary return. The future is no longer a curvature of time where the landscape is hidden from view. It is a plan. Indeed, scientific forestry constructed a curiously presentist version of the future, almost an anti-future, because it hoped that nothing would be left to chance. The tree, far from being a unique marker of past times, became ‘normal’ (the Normalbaum): that is, an imagined predictable tree that was the most likely outcome of forestry policies. A single trunk becomes a microcosm of the forest. Ironically, the future-facing nineteenth-century forester’s vision (of course, in reality these were multiple) is perhaps not so different from the way we might today view the tree ring as a historical source, or as a proxy for climate. It is the measure of greater things, whether a sustainable supply of timber, a changing environment, or a society that holds in regard both past and posterity. A tree literally gives life to these aspirations, and this image evokes, for me, an ensemble of the very varied techniques we have developed to try and grasp or enact that desire.